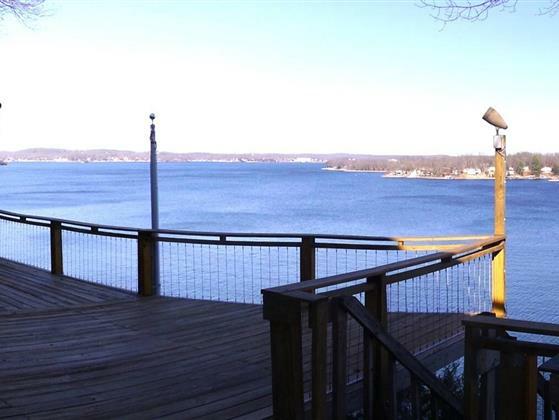 151 FT of LAKE FRONT with an AWESOME LAKE VIEW! Totally Remodeled Lake Home with new Leaded Glass Door & Storm Door. Open Living/Kitchen/Dining. Lots of Lake View Windows & the Living Room has a new Mendota Gas Fireplace & Custom Mantle. All new Kitchen has new Lighting, Custom Cabinets, Quartz Countertops, Tile Backsplash, Stainless Steel Appliances, Pantry, Breakfast Bar & Tile Flooring. Large Master Bedroom/Bath has Lake View Windows, Tile Flooring in Bath & Walk-In Shower. There is lots of extra Storage upstairs & a large Laundry/Utility Room. Included is a Storage Shed & a 1,215 SqFt 2-Car Garage with Carport that has Storage & a Workshop and can store up to a 32' Boat with Trailer. New Concrete Circle Driveway. There is an RV Pad with 50 Amp Hookup. Best View, Sunrises and Sunsets at the Lake.